Here is a review of something I don't currently sell- although I would love to in the future. I had never heard of this company but saw it on a website while I was browsing for Hanukkah gifts for my DS who is 8 months old. It intrigued me although I had a hard time finding info on it. I decided to take the plunge and buy it for a few reasons. Firstly, there was alot for him to do on it and it didn't take up all that much room and secondly it was a little different than anything he already has. When I got it and set it up, I was surprised at how compact it was. That was a good thing because I already have tons of toys and do not need another big klutz. He immediately took a liking to it and started twirling the balls all around. He also pushed himself up on his chest so he can peek in and look at the disk that was twirling around. Basically the toy is based on the kaleidoscope-there are angled mirrors all over adding to the motion and movement. 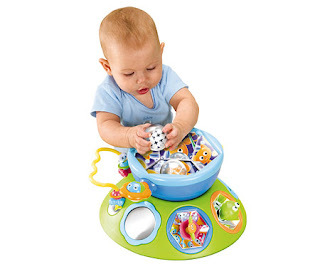 There are activities on the base of the disc area that are fun- a twirling ball, a squeaker, a bar with small toys to push along on it, a mirror... The top part has a place to put a disk (it comes with four). The disk twirls around with music and together with the angled mirrors becomes a whirl of colors and pictures for the baby. It detaches so you can put it on the babies crib. It really is nice. It ends up being so much more than I thought it would be and it is my ds's current favorite toy! !